The Rexel Style Plus 2101946 is a paper shredder for occasional use in an office. It also makes a stylish and practical personal, under-desk shredder. The Style Plus 2101946 is a “pull out” paper shredder design that Rexel has made its own. You can see into the enclosed waste-bin through a porthole. When the container is full you pull out the waste basket. Providing the bin is not over full this design makes for less mess than the “lift off” shredder type. Compared to many shredders, the Style Plus is well designed. It has sleek lines, an intuitive operation and wide paper throat which helps avoid mis-feeds and potential jams. It’s also easy to move about. On the down-side its compact frame means the 12L waste bin is quickly filled. There’s also a question mark over reliability if you believe a shredder should always be worked at full capacity. Rexel claim the StylePlus can devour 7 A4 sheets in one pass. Many users suggest 4 sheets as a practical maximum. Despite these minor shortcomings the 4x23mm cross-cut shreds are unreadable. This is a DIN 3 security rated machine. The Style Plus 2101946 is a quick and convenient way to render down unwanted private papers or confidential financial statements. That puts a stop to document based identity fraud. Rexel Style Plus 2101946 - What’s in the Box? The Rexel Style Plus 2101946 is a neatly styled, compact and unobtrusive, pull-out drawer waste bin model. The operation buttons are positioned on the leading edge of the case and the paper throat is reasonably wide. That means you can place this paper shredder almost anywhere: on your desk, under the desk or beside it. At around £35 or less, the Rexel Style Plus 2101946 is one of the best cheap paper shredders, particularly if you want a smallish, un-obtrusive or desk-top shredder. The 12L waste bin is quickly filled. The waste-bin needs to be checked and emptied frequently. If the bin becomes overfull it chokes off the shredding action. Frequent use a maximum capacity of 7 A4 sheets in one pass can cause the machine to labour and strip nylon gears causing failure. The practical feed through rate is more like 3-4 sheets in one pass. At Best Buys for we make use of owner surveys to locate the best products in a category. We also track prices at a panel of trusted UK retailers so you can enjoy the best cheap paper shredders. A cross cut paper shredder is the practical way to defeat document based identity fraud, maintain privacy and preserve confidentiality. A confetti shredder will securely destroy both paper and staples (but not paper clips). It will render paper work into unreadable chaff that can be placed in paper recycling with peace of mind. 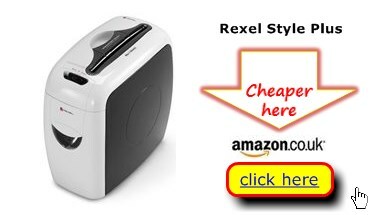 Use Best Buys Compared to check owner-supplied reviews, insights and price comparison details on the best paper shredders for the small or home office like the Rexel Style Plus 2101946.